With so many choices, it can be hard to find the perfect gift for the family dog. We think of our dogs as members of our families, and want to include them in holiday gift giving. 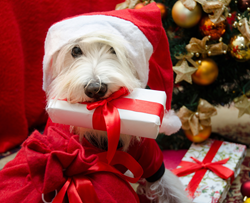 With more than 60 million American households now including at least one family dog, it’s not surprising that gifts for dogs are appearing on more and more holiday lists. “We think of our dogs as members of our families, so we want to include them in our holiday gift giving,” said Renee Coughlin of pet care services provider Canine Company. “But there are so many choices it can be hard to find just the right gift. “Still not sure what to give? Consider a Canine Company Gift Card, which can be used in our Pet Shop online, or towards any of our pet care services,” she adds. Available in $10, $25 and $50 denominations. Canine Company provides at-home pet care products and services that help people keep their dogs and cats healthy, safe and happy, including Invisible Fence® pet containment systems, Manners dog obedience training, as well as mobile pet grooming and pet sitting services in select markets.